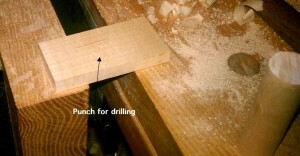 Woodshop Problem-Solving: Now What Do I Do? One of our local woodworking stores asked me to do a hand plane demonstration the other day. Since they have a decent stock of products, I just brought a few personal pieces from home. These items were those I did not expect the store would have, but I believed would help add to my audience’s overall experience. I brought an old, not so great shape metal plane, a couple of wooden hand planes I made, some of my sharpening kit (angle setting jig and honing guide), and a small light hammer for adjusting the blade in the wooden planes, as well as the lateral adjustment of the blade in the metal planes. I arrived at the setting about 30 minutes early, basically so I could take my time setting up before the demonstration started. The employees were kind enough to set me up on a large wooden workbench, which provided plenty of room to spread out the planes and my gear. After they found me some wood to use, I noticed there were no dogs in the workbench. Store management pulled a brass pair from inventory for me to use. After opening the set, it was readily apparent they were the wrong size. The dogs were the standard 3/4” round dogs, but this workbench had massive 1” dog holes. The face vise was still functional, even though all vise handles for the bench were missing. Since I intended to use the hand planes to make shavings, and to allow my audience to do the same, I needed to come up with a couple of solutions on the fly. 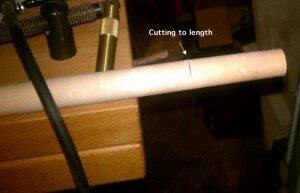 I asked one of the employees to cut some 1” diameter hardwood dowel into a 3” length. Along with that, I asked for a small rectangular piece (about 2” x 3”) of thin plywood. 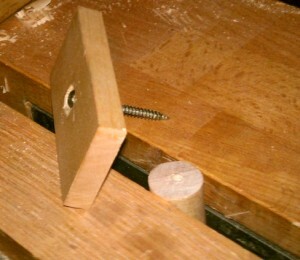 The two were screwed together, making sure to slightly sink the head of the screw, so the plane wouldn’t hit it. This was sufficient to use as a stop, against which we planed the face side of the wood. That took care of one of the two issues. 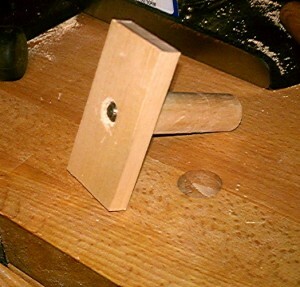 The vise handle was even easier. 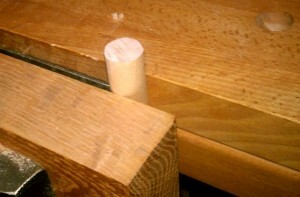 The remaining section of hard wood dowel, which was about 2 1/2’ long, became a temp vise handle. Since they had no plan for long term use, I didn’t even worry about attaching knobs to the ends of the dowel, nor cut it down to a more manageable length. Whenever I needed to either tighten or loosen the vise, I just slid the dowel into the opening and rotated the mechanism. Just remember to keep an open mind when dealing with adversity, and many times you’ll find a quick easy solution to your problem.